Let’s go back one more time to Spring 2015. I had intended at one time to make a whole article about the best characters of the season, a Kristof’s Character Awards if you will, but that obviously did not end up happening. I had such glorious plans too, a section for the best main and supporting cast members, male and female, a section for my favorite of each of the five prime ‘Dere and another section dedicated to just making up categories so that I could include whichever other characters I felt like. But due to so much good anime airing right now and a number of other articles I am trying to put together it was not meant to be. Still wanting to write about some of my favorite characters I decided to use this as the forum, so this week’s question is: who were your favorite characters from Spring 2015? Conversely, were there any characters you could barely stand watching, even in a good show? What about your favorite character architype? Is there one that you will still enjoy even if the character is poorly written? What about a least favorite? Are there characters you can’t stand no matter how well written they are? 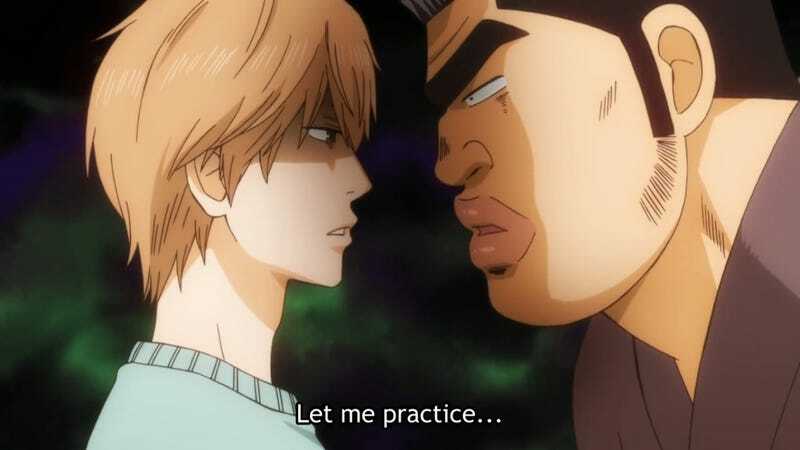 For all of the questions that I have just asked I am only going to write about one character, my favorite of Spring 2015, Suna from Ore Monogatari. Had I made the awards article I mentioned above, he would have won both best supporting male character and best kuudere. Not only was he the greatest bro of the season, the image above being the a prime example of this, though he did not have much choice this time around, he also keeps one of the straightest faces out there while still caring deeply for his best friend Takeo. We would all be better off for having a friend like Suna. Some other great characters from the season, in no particular order: Zapp from Kekkai Sensen, Dio from Jojo’s Bizarre Adventure, Ura-tan from Etotama and Noa from Yamada-kun. Please don’t be offended if your favorite is not one of my favorites, just get your revenge by talking them up in the comments.